From Dubbo, I had a decision to make. We wanted to visit the Blue Mountains and Sydney area to see friends and family — and this had been our original plan — but the huge bushfires still burning on our route have put me off. Our alternative was to travel to Victoria via the inland highways, which means that we’ll be going through the country that was familiar to me from my very first years in Australia as an adult. 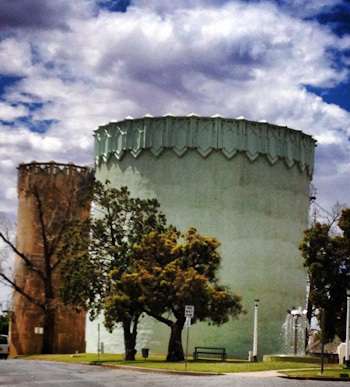 Leeton's landmark is the large water towers that occupy the top of the hill in the centre of town. It's located within the Murrumbidgee Irrigation Area and a series of channels direct river water in and around the township and surrounding farms. To me, Leeton is as familiar as the parts of Brisbane in which I lived for ten years. I know the streets from walking them, delivering pamphlets. I know the businesses from designing newspaper ads to promote their sales. Many of our friends live in exactly the same houses, and so I feel confident in simply turning up and leaving a note in the letterbox to let them know we’re in town. It has been good to return to Leeton to catch up with our friends here. These are folks who knew me from when I was fresh off the plane from Africa, nineteen years old with an ego the size of the Outback. They knew me when I only spoke American and horribly mispronounced the town names in the area. (How would you say Narrandera?) These friends knew David and I before we got together and watched as our romance blossomed into a wedding. So I have a lot of personal history in Leeton. We last visited Leeton in June 2007 when we were considering buying the local floorcoverings shop from our friends. That visit was the catalyst for our house renovations which led to our trips to New Zealand and ultimately our life on the road. The girls don’t remember Leeton, and as so our first stop (after the Golden Apple!) was Mountford Park with its huge spiral slide. However, the slide was no longer there, but the fancy new equipment was just as fun for the girls. 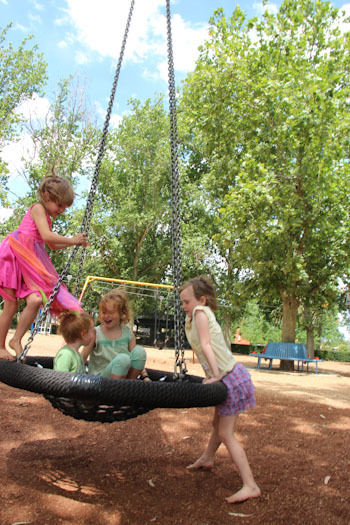 The girls love the dish swing — they can all play together on it at the same time! A twin zip-line sets the girls up to race each other to the end. It leads to an interesting discussion about the physics of motion as affected by mass. 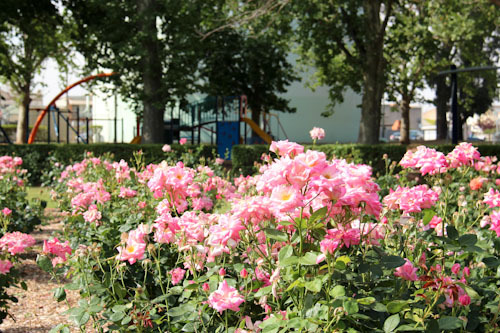 Mountford Park is also the site of a beautiful set of rose gardens whose scent beguiles us while we play. Leeton will also be a maintenance stop for us. I hope to get a little bit more work done in the bus. Always — like in any home — there are repairs and modifications to be done in the bus, and sometimes I need to borrow tools, materials and electricity from friends whose workshops are equipped better than my meager toolbox. I’m looking forward to being here for about a week. We’ve got many different people to catch up with, and I’d love the girls to start forming their own memories of Leeton so they realise they can return here whenever they want the small country-town experience. It’s good to be back! You have the best playgrounds in Australia, at least from the photos. I’d love to play on them and I’m an adult! !